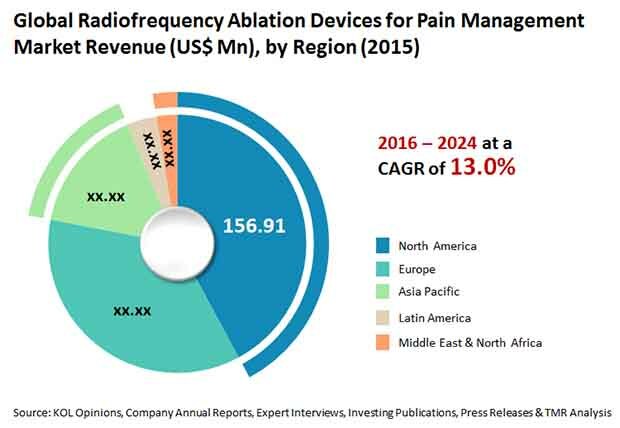 The vendor landscape of the global radiofrequency ablation devices for pain management market has three companies accounting for a whopping 88% share in the overall market, features a small number of manufacturers, and a large number of raw material providers, observes Transparency Market Research (TMR) in a recent report. High threat of substitutes such as implantable drug delivery pumps, neurostimulation devices, and transcutaneous electrical nerve stimulation devices and limited product differentiation options have intensified prices competition in the market. To achieve sustainable profits, companies are trying to increase their share in the global market by launching new versions of existing products, entering into collaborations with niche technology companies, and acquiring companies present in developing economies. Expansion across high-growth potential regional markets by establishing manufacturing plants and distribution chains is also a popular growth strategy. Despite the intense competition, TMR predicts that the market will exhibit a promising 13% CAGR over the period between 2016 and 2024, rising to a valuation of US$1,114.5 mn in 2024 from US$372.7 mn in 2015. On the basis of product type, the report examines radiofrequency ablation device varieties such as RF generators, disposable products, and reusable devices. Of these, the segment of disposable devices dominates, accounting for a significant share of 40% in the global market in 2015 and is expected to retain dominance throughout the forecast period. Geographically, developed countries in North America presently have the leading demand for radiofrequency ablation devices for pain management owing to the high prevalence of conditions inducing chronic pain. The large number of surgeries performed every year in the region also leads to the increased demand for effective pain management solutions. Over the report’s forecast period, the North America market will continue to account for a significant share in the global market owing to the abovementioned factors and also due to the presence of world’s leading vendors in the region. The most promising growth opportunities, however, will be seen in emerging economies in regions such as Asia Pacific over the forecast period. The rising global geriatric population, increased prevalence of a number of chronic conditions, and a significant rise in the number of people suffering from chronic pain are the key factors expected to fuel the global demand for radiofrequency ablation devices for pain management in the near future. The increased preference to non-invasive pain management procedures, owing to their benefits such as low risk of side effects, lesser post-procedure complications, and shorter recovery span as compared to invasive procedures, is also a key factor driving the market. Ablation devices are considered class III medical devices in the U.S. and European countries. This makes their approval a lengthy procedure, involving a vast array of safety and efficacy related trials. Several strict regulations also put restrictions on aspects such as the design, production, and marketing of these products in the market. These factors not only delay the process of approval and commercialization of new products, but also lead to the increased base cost of products, which, in turn, hamper the profitability of vendors in the market.